An unaltered photocopy of your NAVPERS or DD-214 authorizing your CAR authorization. Retro-active to 1941, The Combat Action Ribbon was established on February 17, 1969, by Secretary of the Navy John H. Chafee and announced by SECNAVNOTE 1650 of February 17, 1969. The Annual Defense Authorization Bill (Public Law 106-65) signed into law by President Clinton on October 5, 1999, authorized the Secretary of the Navy to award the Combat Action Ribbon to members of the Navy or Marine Corps who participated in combat during any period after December 6, 1941. The Combat Action Ribbon originally took effect on March 1, 1961; however, with the passage of Public Law 106-65 (cited above), award of the Combat Action Ribbon may now be made retroactive to December 7, 1941. 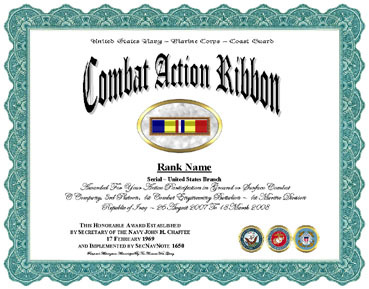 NAVY AND USMC PERSONNEL: The Combat Action Ribbon is a personal decoration awarded to members of the Navy, Marine Corps, and Coast Guard (when operating under the control of the Navy) in the grade of captain (or colonel in the Marine Corps) and below who have actively participated in ground or surface combat. Current Marine and Naval personnel who earned the Combat Infantryman Badge or Combat Medical Badge while a former member of the Army and now a Marine or Sailor may be authorized to wear the Combat Action Ribbon. ARMY PERSONNEL: Army and Air Force personnel may be authorized the Combat Action Ribbon by Naval or USMC commanders only when operating in direct support of naval personnel on a naval vessel or operating in combat or combat support within a Marine unit engaged against enemy forces. Wear of the CAR on the Army uniform must be approved by local Army commanders. The Combat Action Ribbon is worn after the Navy Achievement Medal and before the Navy Presidential Unit Citation. Because this ribbon is considered to be a personal decoration, additional awards are indicated by gold stars five-sixteenths of an inch in diameter (an additional star in silver of the same size denotes a sixth award). a. Authorization. SECNAVNOTE 1650 of 17 February 1969. (1) Awarded to members of the Navy, Marine Corps, and Coast Guard (when the Coast Guard or units thereof operate under the control of the Navy) in the grade of captain/colonel and junior thereto, who have actively participated in ground or surface combat. Upon submission of evidence to their commanding officer, personnel who earned the Combat Infantryman Ribbon or Combat Medical Ribbon while a member of the U.S. Army may be authorized to wear the CAR. (2) The principal eligibility criterion is that the individual must have participated in a bona fide ground or surface combat fire-fight or action during which he/she was under enemy fire and his/her performance while under fire was satisfactory. Service in a combat area does not automatically entitle a service member to the CAR. The following amplifying remarks are furnished as guidance. (a) Personnel in riverine and coastal operations, assaults, patrols, sweeps, ambushes, convoys, amphibious landings, and similar activities who have participated in fire fights are eligible. (b) Personnel assigned to areas subjected to sustained mortar, missile, and artillery attacks actively participate in retaliatory or offensive actions are eligible. (c) Personnel in clandestine or special operations such as reconnaissance, SEAL teams, EOD teams, and Mine Countermeasures operations are eligible when the risk of enemy fire was great and was expected to be encountered. (d) Personnel aboard a ship are eligible when the safety of the ship and the crew were endangered by enemy attack, such as a ship hit by a mine or a ship engaged by shore, surface, air or sub-surface elements. (e) Personnel eligible for the award of the Purple Heart would not necessarily qualify for the Combat Action Ribbon. his orders by not returning fire. (g) The CAR will not be awarded to personnel for aerial combat since the Strike/Flight Air Medal provides recognition for aerial combat exposure; however, a pilot or crewmember forced to escape or evade after being forced down could be eligible for the award. (h) Under Public Law 106-55, the CAR may be awarded retroactively to 07Dec41. (1) Southeast Asia. From 01Mar61 to 15Aug73. (3) USS LIBERTY (AGTR 5). 08Jun67 and 09Jun67. (4) USS PUEBLO (AGTR 2). 23Jan68. (e) Persian Gulf MCM Operations. Specific units during 19Nov87 to 01Apr88; 14 to 20Apr88; 20 to 23Apr88; and 02Aug90 to 10Sep91. (12) Operation DESERT STORM. 17Jan91 - 28Feb91. (13) El Salvador. 01JAN81 to 01FEB92. (15) Cambodia. 01JUN92 to 15NOV93. (16) Operation ASSURED RESPONSE (Monrovia, Liberia). 07Apr96 to 18Apr96. (No ships qualified). (17) Kosovo Campaign. Specific units designated from 24Mar99 to 27Jan00. d. Administrative Procedures. SECNAV determines which operations meet the criteria for this award. Requests for determination of eligibility of individuals for operations subsequent to 1975 should be sent to SECNAV via the chain of command including CNO or CMC, as appropriate, unless specifically delegated by SECNAV. (1) Awarded to members of the Navy, Marine Corps, and Coast Guard (when the Coast Guard, or units thereof, operate under the control of the Navy) in the grade of captain/colonel and junior thereto, who have actively participated in ground or surface combat. (a) Direct exposure to the detonation of an Improvised Explosive Device (IED) used by an enemy, with or without the immediate presence of enemy forces, constitutes active participation in a ground or surface engagement. Eligibility under this criterion is retroactive to 7 October 2001. (b) Personnel who serve in clandestine or special operations, who by the nature of their mission, are restricted in their ability to return fire, and who are operating in conditions where the risk of enemy fire was great and expected to be encountered, may be eligible for the CR. (c) The CR will not be awarded to personnel for aerial combat, since the Strike/~light Air Medal provides recognition for aerial combat exposure; however, a pilot or crewmember forced to escape or evade, after being forced down, may be eligible for the award. (d) Current DON personnel who were formerly in the U.S. Army and earned the Combat Infantryman Badge or Combat Medical Badge, upon submission of official military documentation to their commanding officer, may be authorized to wear the CR. (e) Under Public Law 106-65, the CR may be awarded retroactively to 7 December 1941. See Chapter 8 for information regarding retroactive eligibility determinations. c. Eligible Operations. SECNAV, or his designee, determines which operations meet the criteria for this award. Appendix E to this chapter lists the operations for which award of the CR has been authorized. An individual, whose eligibility has been established in combat in any of the operations listed in Appendix E, may be awarded the CR. Only one award per operation is authorized. The listing is not all inclusive, as the CR has been awarded in minor operations, as well as for - specific actions. 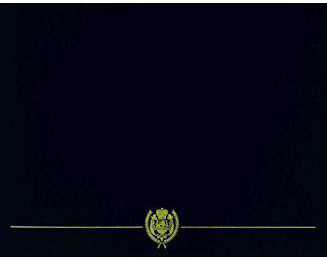 Chapter 8 contains information regarding requests for eligibility determinations for personnel no longer on active duty.